The Haydn Trio Eisenstadt, one of Europe’s foremost chamber ensembles, is marking the bicentennial of Haydn’s death with a special appearance at Syracuse University. The commemorative concert, part of “Haydn Year 2009,” will be Tuesday, Nov. 17, at 8 p.m. in the Joyce Hergenhan Auditorium in Newhouse 3. The program consists of two Haydn piano trios: Nos. 27 and 29 in C and E-flat major, respectively; Schubert’s Piano Trio in E-flat major, Op. 100; and Bongani Ndodana-Breen’s “Two Nguni Dances,” a South African piece dedicated to the memory of Haydn. The concert is free and open to the public. For more information, call 443-5823. Free parking is available between 7 and 10 p.m. Regular parking is in the Lehman and Harrison lots; handicapped and elderly may park in the Waverly lot. “We are extremely privileged to host the Haydn Trio Eisenstadt, which is traveling the world as ambassadors of Haydn’s home region,” explains organizer Karl Solibakke. “You can probably say that the trio has been preparing for this tour since 1992, when it was founded. The group is one of the chief exponents of Haydn’s music and of chamber music, in general.” Solibakke is associate professor of German studies in the Department of Languages, Literatures and Linguistics, as well as The College of Arts and Sciences’ assistant dean for finance. The trio’s visit, which includes an in-class lecture-demonstration in The College’s “Performance Live” course, is made possible by generous support from George Langford, professor of biology and dean of The College; David Rubin, professor of communications and interim director of the Goldring Arts Journalism Program, both in the Newhouse School; and Stephen Meyer, associate professor of art and music histories in Arts and Sciences. The concert is presented in cooperation with Haydn 2009/Haydn Festival Eisenstadt and the Austrian Cultural Forum New York. Rubin is excited because the concert is the second of its kind in Hergenhan Auditorium. “We designed the auditorium with the hope it would be used for chamber music. The hall is intimate with unobstructed sightlines, and the sound is alive. It is a wonderful place to hear such a distinguished group,” he says. As “father” of the symphony and string quartet, Joseph Haydn (1732-1809) began his career as a member of the Vienna Boys Choir. Most of his life was spent as a composer at the Esterházy court (in what is modern-day Burgenland and Hungary), where he also pioneered development of the piano trio and a compositional structure called “sonata form.” Haydn later settled in Vienna, where he befriended Mozart and taught Beethoven. All told, Haydn composed hundreds of instrumental and choral works, including 104 symphonies and 90-plus string quartets. 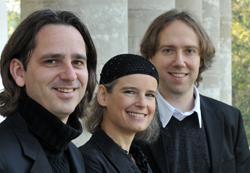 The present lineup of the Haydn Trio Eisenstadt consists of pianist Harold Kosick, violinist Verena Stourzh and cellist Hannes Gradwohl, all of whom have been members since 1998. In conjunction with “Haydn Year 2009,” the trio is busily performing and recording the composer’s complete piano chamber music oeuvre, including 39 piano trios, 429 Scottish songs and dozens of concertini and divertimenti. The group is also spearheading a large-scale composition project called “D2H (Dedicated to Haydn),” featuring piano trios by 18 composers, including Ndodana-Breen, from around the world.